Aston Martin teased us last week with two videos that showed us something very fast and very extreme was coming. The British automaker is celebrating their 100 th anniversary in a big way as they just released the new CC100 Speedster Concept at the Nordschleife at Germany’s ADAC Zurich 24 Hours of Nurburgring race. Now they have just revealed the most extreme Aston Martin ever created, the new V12 Vantage S. Just how extreme is the new supercar? 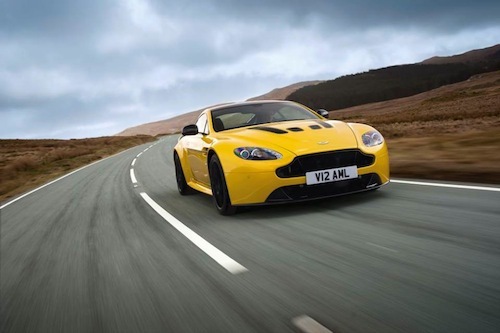 Aston Martin tells us the new V12 Vantage S will pump out a whopping 565 horsepower (573 PS) at 6750 rpm. It will be powered by the new AM28 6.0-liter V12 engine, featuring the latest generation Bosch engine management. AM tells us the new sports car will have a top speed of 205 mph. The torque on the new 6.0-liter V12 has also been bumped up to 457 lb ft (620 Nm) up from 420 lb ft (570 Nm). Torque on the low end has also been increased from 324 lb ft to 376 which will make a big difference in drivability. Sprint times have not yet been released, but the new V12 Vantage S is going to be very quick. The race technology shows up under the hood with CNC machined combustion chambers and hollow cam shafts being two examples of track technology “feeding through to the road.” Another example is evident in the sports car’s new gearbox. The car debuts the new Sportshift III AMT (automated manual transmission) and is a major development of the automated manual gearbox that appears in the current V8 Vantage S.
The new gearbox features motorsport-style paddle shifters for optimum driver involvement. The unit is also much lighter than the outgoing six-speed gearbox and saves 25 kg in weight. Another first for this new extreme version is a three-stage adaptive damping system that features ‘Normal’, ‘Sport’ and ‘Track’ modes and can be tuned to fit the driver’s needs. It also governs the level of power steering assistance needed. The ZF Servotronic power assisted steering is new, too, with a quicker 15:1 ratio. Outside, the new V12 Vantage S features a new grille that does away with the previous aluminum vanes and replacing them with new sporty carbon fiber or titanium mesh. the new grille comes from the new CC100 Speedster Concept, nicknamed DBR100, which made its debut at the 24 Hours of Nurburgring earlier this month and signals a new design language for the brand. It also features new lightweight forged alloy ten-spoke wheels, and a subtle yet distinctive exterior graphics pack that includes black painted roof and part-painted boot panel. Inside, the new supercar gets new-style seating with Sport and carbon fibre lightweight seat options, revised stitching and welt detailing, two leather grade options, Luxmill and semi-aniline. Buyers can also chose the optional Carbon Fibre Interior Pack, which adds the material to the car’s facia and door pulls, plus the availability for the first time in a V12 Vantage S of black pedals. Performance car enthusiasts can clearly see that Aston Martin is not done after 100 years. The CC100 sports car and new V12 Vantage S shows there are some very exciting days ahead for the British automaker. The CC100 Speedster Concept gives us a glimpse of the future design direction and the V12 Vantage S shows us that performance is here to stay for the brand. With a top speed of 205 mph and peak power of 565 horsepower, the new Aston Martin V12 Vantage S is the quickest production Aston Martin ever created. It delivers stunning performance figures and will give its owner an intense driving experience. Watch the extreme new Aston Martin V12 Vantage S video.